When I saw the word prompt, "gift", for the December edition of Smile for the Camera, I knew right away I couldn't contribute just one photo. My family didn't take a lot of photographs but Christmas was a popular time for them to pull out the ole camera. I looked over my collection of Christmas photos and sure enough many of them included gifts. 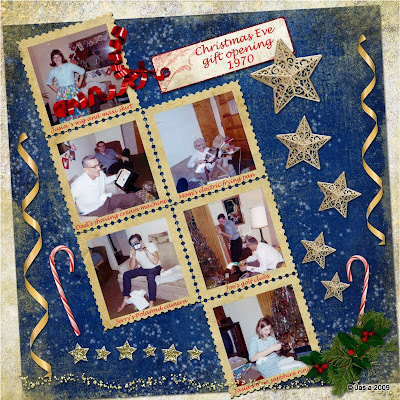 I decided to create a digi-scrap page for the Christmas Eve 1970 pictures. So here you have it, our gift-opening excitement at its best! The top picture is me donning my new wig and the maxi-skirt my mom made me. Wigs were very popular at the time and being a natural blond, I wanted a wig that was dramatically different. I remember going shopping with my mom and picking out this wig. As soon as I put it on I fell in love with it. So my mom bought it for me along with a Styrofoam (head) wig base and a carrying case. High fashion in 1970 included full length ("maxi") skirts, coats, and dresses... along with mini skirts of course! I had no problem buying mini skirts but being 5'9" made buying maxi-skirts nearly impossible. They were all too short! So my mom made me the one in the picture. My dad got a hot shaving cream machine that Christmas. This was one of those better-in-theory-than-in practice-gifts. I distinctly remember that my dad used that thing exactly once. He put the shave cream on his face and came out of the bathroom long enough for me to take a picture of him and that was it. I wish I still had that photo but I haven't seen it in years. I have no idea where it might be (or if it got thrown away). My mom got an electric frying pan and boy was she excited about it. She used that fry pan a lot over the years. She always made her Salisbury Steak in it and she fried up her pierogi in it too. I have that frying pan now. It still works well and it brings back lots of good and tasty memories! My brother Jerry got a Polaroid camera in 1970. I'm sure he must have used it but I don't remember seeing any pictures from it. The instant picture technology was very popular at the time! And last but not least, the bottom photo is of me opening my blue star sapphire ring, a gift from my dad. It was my first piece of fine jewelry and I still have it. You don't see star sapphires much anymore but they were very popular at the time. Those weren't the only gifts we received that Christmas but they are the only ones I have photos of. Oh it's so nice to have the memories!